After the sad death of Dash and Jella's departure, the crew of the Rampart set about finding some new members. Jann Silman put them in touch with some old explorer associates of his. "Kilo", an ex-military war-bot bounty hunter and "Muscleman" a hulker adventurer with a background in enforcement. They arranged to meet on board the Rampart for a meet up and interview. They are interrupted by 5 UNITY enforcers led by a power armoured special agent... Havok ensues. This was an enemy assault scenario. The enforcers had to attack the engineering computer (represented by a computer console model from Khurasan) to win. Opening a door takes the place of either moving or firing. 1 square= 1", moves may be made in any direction, but a figure may not make 2 consecutive diagonal moves. If a crew member can get to a security station, they can lock all the doors. Locked doors will need to be broken in following the standard FiveCore door rules. The fight went well. 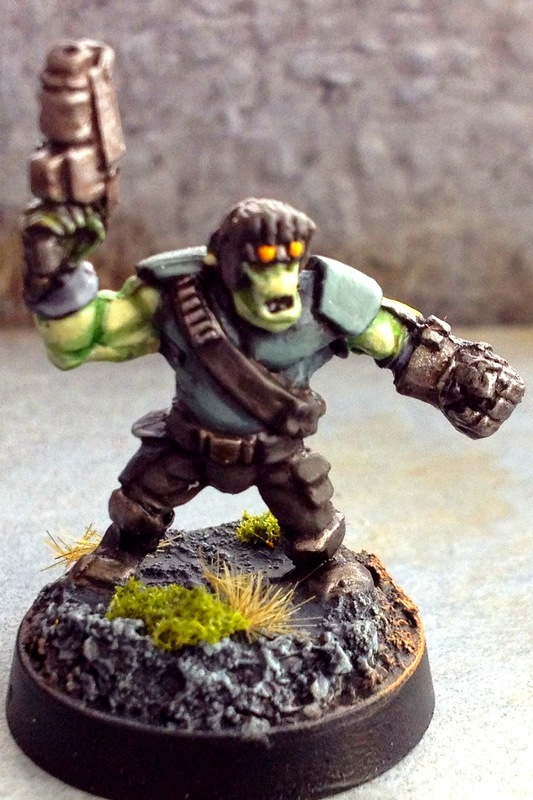 Once again, Toros' military assault carbine's 3 shock dice of SUPPRESSIVE FIRRRE!!! made it very difficult for the UNITY enforcers to get into the main hold. As a figure that has fired on its previous turn cannot use guard fire, this meant that careful repositioning of Kilo and Toros was required to keep the corridor covered. A scurry turn got the power armoured agent into a good position eventually, shrugging off 2 shots thanks to his protective suit, but Muscleman managed to charge him and smash him with his power claw. Mackie finished the battle with a dramatic charge with her brutal melee weapon (a big wrench) and sent the last enforcer flying! When the smoke cleared, only Muscleman was injured. He sustained a wound that would force him to miss 6 turns. I decided to use my medkit to avoid this. A tricky decision, as I was saving it to prevent a death... But on the Fringe, 6 turns is a very long time. Muscleman lives up to his name, so I think it's better to have him around kicking heads than missing so many missions. A sterling debut from two deadly new crew members. Mackie is now the only human on board, amongst an ever increasing number of dangerous alien and robot killers! With the Vespulids and UNITY now as enemies, it was time to get off Imhotep! The starship tiles were interesting. I think the layout was a little dull, but it still threw up a lot of interesting choices thanks to the Scurry and Firefight turns that came up when they did. If I use the tiles again for a scenario like this, I think random deployment (of both sides!) would better represent the chaos of a surprise hostile boarding. I'm thinking of the Firefly episode when the bounty hunter infiltrated the ship at night and the crew were all over the place. I've been thinking about coming up with a whole "space voyage" campaign turn that replaces a normal turn whenever you wish to change planets. As it stands, leaving the planet (and getting the chance to elude enemies) is a simple choice that has no down-side. I'm thinking of a simple campaign turn with "space flight" tasks instead of planet-side ones, and a small chance to be boarded or otherwise get into trouble. Finally, as requested, here is a photo of my station modules split apart and without all the clutter. By revolving them and obeying the "no double walls" rule, a huge variety of spaces can be had in a jiffy. The two lower modules were afterthoughts. The original plan was to only use 6 pieces (of 3 designs) to simulate cyberpunk office layouts. The empty walls were actually conceived as plate glass windows. I've been trying to decide wether to try my hand at laser etched MDF, or sculpted pieces in resin for a fancier batch. I'm leaning toward MDF, as I think I could get some great results with the use of acrylic pieces in the windows. I find MDF is extremely difficult to paint however, which is the only thing giving me pause. When I built my Mad Mecha Guy city buildings, spray paint just bounced right off. I had to hand-undercoat each one with decoupage primer in the end, which took ages and I don't want to do ever again. The Spaceport at game start. After an uncomfortable beginning, Dash, Toros and Mackie all head into town looking for a Patron (Sending 3 crew members is an auto-success with this task). Jella manages to get a good deal on an auto rifle at the markets, while T92 guards the ship again. The explorer Jann Silman is holed up in his ship at the spaceport. He has an unmarked crate of goods he is unwilling to leave behind, but a group of Vespulid pirates bar the way. I rolled 5 opponents, one a leader. They were Orange Aliens, with claws/fangs and hive mind talents... I chose my vespulid figures to represent them. This meant they were all armed with handguns, the leader with 2. The delivery mission called for the crew to carry something to the other side of the board. As I wanted to use my interior modular scenery, I started my crew in one corner and rolled random module placement for the Vespulids by rolling a d4 for each one. The crate would be represented by a crate model from GZG, and I ruled it could be carried 4" per turn (the speed a figure can carry a wounded comrade in the game) by one figure, or 6" per turn if carried by 2 cooperating figures. Dashing while carrying the crate is not permitted. Dash and Jella grudgingly teamed up on point. A single Vespulid eluded their fire and tore Dash up in close combat. (+1 to brawl for claws is actually pretty deadly, especially when charging.) Before she could react, the alien followed up 2" and quickly dispatched Jella as well. Mackie and Tommy 92 moved up with the crate, Tommy's shotgun making quick work of the blood splattered Vespulid. 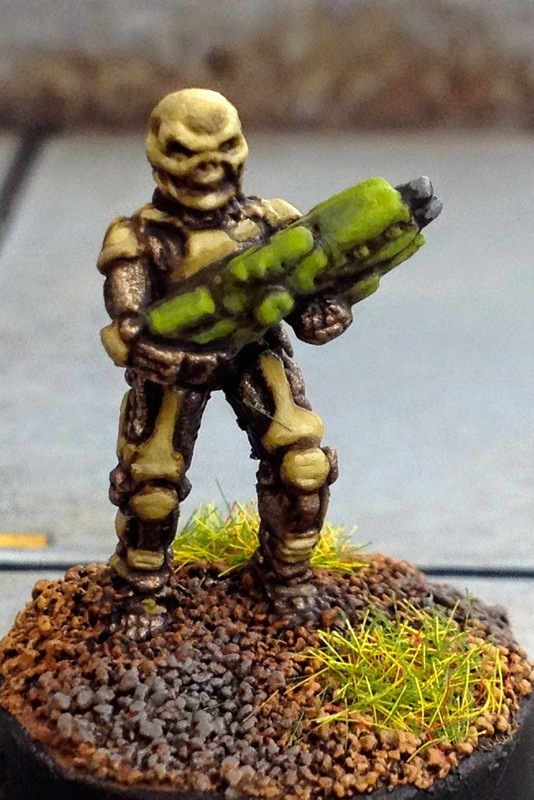 Toros used the suppressive fire mode of his assault carbine to send all the Vespulids on his flank scurrying for cover. 3 shock dice really lays down a withering hail of fire that usually results in at least a Flinch. Another couple of Scurry turns got Mackie and T92 all the way to Bar Gyro unharmed. Toros plodded along covering their rear and laying down a lot of (Cyril Figgis-style) SUPPRESSIVE FIIIIIRRRE. A final Fire Fight turn saw T92 flinch and dive behind some tables, leaving Mackie to crawl to the exit, pushing the crate along the floor. Success! After rolling up a loot item and a trade item (Patron missions grant a trade item as a bonus) I rolled for Dash and Jella's injuries. Dash died and Jella suffered a career ending injury. Was it really internal bleeding, or was it remorse for never making up with Dash before he died saving her life? A sad end to an outlaw artist's tale. Next episode, Toros' enemies, the UNITY enforcers will be attacking the crew. It's an Assault mission, which I think I'll do on board their ship, the Rampart. Exciting! This game took place on a board only 18" square. The terrain is custom built using 6" MDF squares as bases, 6mm cork tile walls and cardboard panels for floor detail. It was originally going to be an office for cyberpunk-ish games, but watching the 2012 Dredd movie made me want to turn it into a Mega block. It's fairly generic, so works (possibly better) as a spaceport too. I spent a lot of time planning it, going as far as to build a 3d prototype in Google sketchup to test out if revolving the modules would make an interesting enough variety of setups. As there are only 4 basic room types, each one only having 2 walls (for ease of moving figures) the build was very easy, cheap materials and straight cuts. Interestingly, the even smaller than normal spaces worked fine due to the density of cover. FiveCore has a slightly unusual cover mechanic which allows a figure to "Hide" or "Peek" when entering cover or activating subsequently. Hiding figures cannot shoot or be shot at , while peeking figures can. Peeking figures are better off vs shock dice than one in the open, but otherwise quite vulnerable. Hidden figures are for the most part totally safe. I find this a really refreshing way to handle cover, but also really fun, as it adds an interesting decision to taking cover each time. My advice is the more terrain the better... Avoid just plunking down a few pieces if you want an interesting game! I have been using 6"+1d6" as a Bail distance instead of the stated 12". I like this for smaller game areas as it adds a small element of uncertainly when a figure runs away. It's also the same as a Dash move, only involuntary. That's all for today, keep your blaster handy... You never know what's around the corner on the Fringe! I have been spending a lot of time messing around with rosters and QRS sheets convenient to use on my 13" laptop while playing 5 Parsecs. I don't have a printer you see. Unfortunately, in the heat of design, I accidentally deleted part of my original roster. Oops. No matter, I'll write off the crew of the Patagonia as a test run. A story this crew heard in a bar... Which coincidentally is what I rolled for how they met. A cliche, but hey- If it's good enough for countless RPG campaign beginnings it's good enough for me. I salvaged what I could, and rolled up what I couldn't remember. This time I used my own house rules to help generate the crew, as is suggested under "freeform characters" on page 23. My method was to choose my set of 5 figures first. In this case, the free trader crew set from Khurasan (of course) which I have been dying to use for something for a long time. I rolled all the human characters as normal (some of these were salvaged from my first crew, as I really liked Jella Hart, the outlaw country singer from a rich family. Archer fans will know why this is so funny) but selected "Orange class alien" and randomised between "Droid" and "warbot" for the mechanical member of the crew. 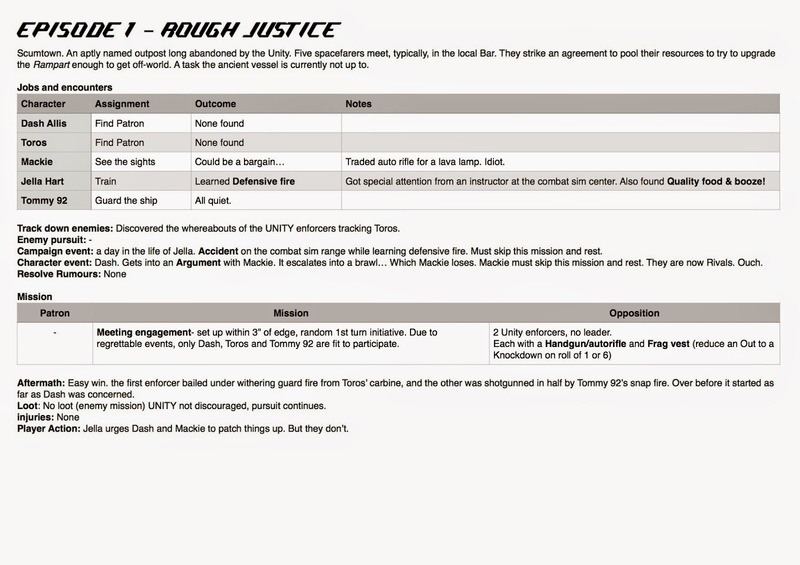 I rolled 3 alien traits for Toros, and added "UNITY enforcers" as a group enemy, as Orange class aliens are hunted by the law. And there's how it went down. A very eventful campaign turn and a short scuffle with the law. Feelings were hurt, jaws were hurt... Nobody made any money. Just another day on the Fringe! Well, I made it back to the UK. I'm much happier and my adventures continue. This week I took a chance on "Five Parsecs from home", a sci-fi campaign book for the FiveCore system. I say took a chance because I couldn't find much about the product on the internet, but it seemed ideally tailored to the sorts of game I have been looking for, basically forever. Unbelievably, every one of these claims was completely accurate. The FiveCore rules are a separate (inexpensive) download but the campaign book is where the whole package really starts to shine. It has a lot of very sci-fi specific extra stuff that meshes seamlessly with the core rules. This is because almost all new rules introduced still follow the same basic (and dead simple) dice mechanic. This one point makes it very easy to make up new rules, even on the fly if you want. 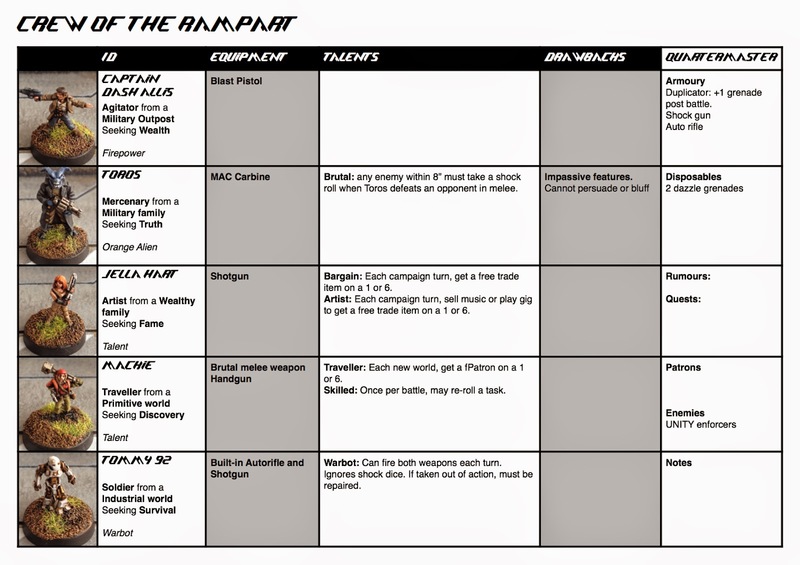 The campaign system features a plethora of charts to generate characters and events. What I liked about them was that they provide enough detail to get your creativity fired up, but are not especially constrictive. The whole thing is designed to assist imaginative narrative. The bottom line is that after reading the books, I immediately set to rolling up a Group and playing a game. An extremely rare occurrence! I used my freshly rolled team against a simple gang for this first skirmish. I would definitely suggest using at least a couple of talents or special bits of gear on each side, even for your first game. Testing the game using bland identical figures will not reveal the richness of the system. It is not an exercise in power-gaming. The game went splendidly. My group attempted to blow up a parked vehicle and escape into the woods. After 13 turns, 2 of team had bailed (run away) two were down on the ground from gunfire and a brawl respectively, and the last man (alien) standing detonated the vehicle's fuel tank with some well placed rifle fire. Both downed team members recovered, although one will have to skip the next 2 battles and has a permanent limp, and the other has suffered mental scarring. I will close this quick post with a bombshell. I've found my system. I have no regrets about the last 4 years of buying, reading and testing rulesets (e.g Multiple Ganesha games, most THW, Pulp Alley, iTen, FUBAR, Savage Worlds et al) which have all had some really cool points... But the FiveCore Skirmish Narrative campaign combo has rendered all of them second-place in one play through. (at least as far as solo small-scale sci-fi narrative skirmish gaming is concerned). Thank you Ivan Sorensen for writing such a great set!